According to whom you talk to, the 2017 Rolls-Royce Wraith is most powerful and dynamic Rolls-Royce ever produced. Power aside, the 2017 Rolls-Royce Wraith is, as you would expect, dripping with luxury at every turn. A massive 6.6-litre, twin-turbo V12 massages out an incredible 624bhp that has a crushing 590 foot-pounds of torque. Putting the pedal to the metal in this car can be frightening experience. Most drivers would never imagine that such a huge and heavy luxury car could accelerate so fast and so effortlessly. The car will easily do 0 to 100kph in 4.6 seconds. And that’s saying something considering that the car weighs 2,360kg. 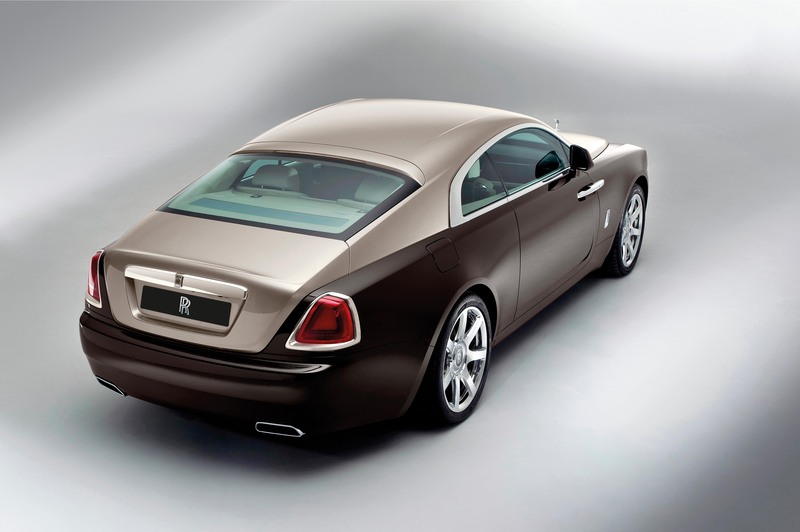 The Wraith is more powerful and quicker than the Ghost sedan, which served as the donor chassis for this mammoth coupe. 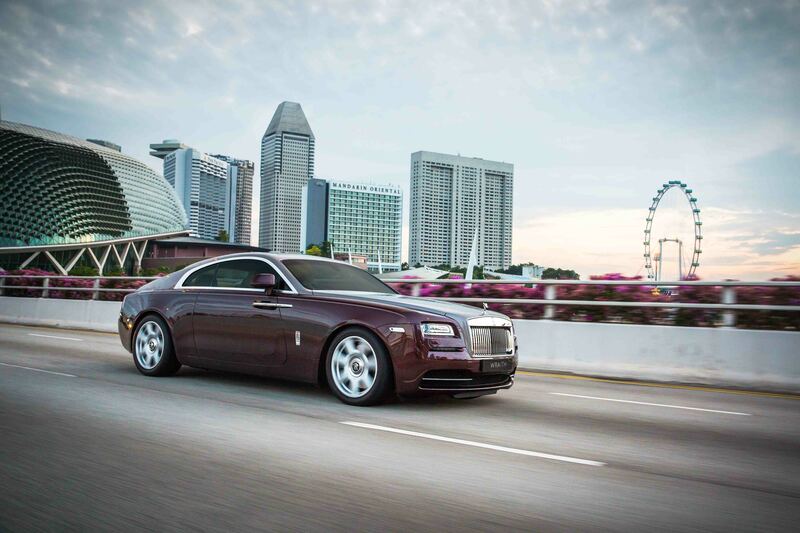 Designers at Rolls-Royce took off more than 170mm from the Ghost’s wheelbase to create the Wraith, but, with a 3,112mm wheelbase, and with a length of 5.2 meters, the coupe is still bigger than the beefy Chrysler 300. With all that power and speed the Wraith accelerates in a calm, refined manner, and there is no harsh engine noise or whining of the two-turbo chargers. Top speed of this luxury beast is set; yes, set on purpose, at 250kph. It appears the Rolls-Royce engineers at Goodwood were aware of Newton’s second law that says: Force (Velocity) = Mass x Acceleration. Too fast in such a heavy car could be a bad thing. 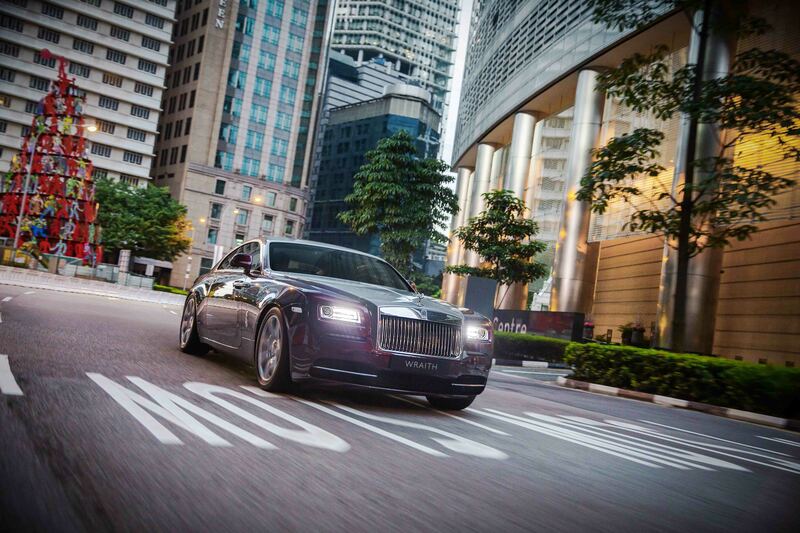 Unlike all other Rollers, the Wraith is a fastback coupe. The design was defiantly inspired by the Italians, but somehow Rolls made it their own in this incarnation. The sharp fold between the roofline and the severe squared off shape of the lower body serves to make the Wraith one of few modern cars that looks fantastic in a two-tone paint finish. And with its gently sloping and narrowing rear end, the car’s rear styling has more in common with a classic Riva speed boat than any other Rolls-Royce models. The other important feature on this car is that it only has two, rear hinged coach or "suicide doors". They are massive. But don’t worry; you’d never have to reach for the door handle to close the door. That would be ungainly and awkward. No, Rolls has provided a switch that gently shuts the door—almost the way a vault closes—solid and secure. Rolls-Royce does make one other two-door model, the Dawn, but that vehicle is just a sportier version its four door offerings. Rolls-Royce has done some clever engineering to make the Wraith way more agile and aggressive than any other of the cars in its fleet. It really feels and drives more like a sporty car that a two-ton luxury vehicle. The augmented Rolls-Royce V12 is powerful yet understated. It’s almost as if the car says to you: relax, if you need more power, I’ve got plenty in reserve. Matched to twin turbocharged power plant is an 8-speed ZF automatic transmission, which is super smooth and graceful when changing gears. In fact, it’s hard to feel a gear change at all. Rolls-Royce engineers also made the steering accurate but not overly so. The steering is light and friction-free, though still tactile and precise. Again, it’s relaxed and easy to drive. There is no over or under steering, which is an incredible accomplishment considering the weight of this beast and its size. As with most large luxury cars, the Wraith has rear wheel drive. The car’s chassis is superbly balanced on air-cushion suspension, which is adjustable to different ride parameters. The suspension, which consists of multilink front and rear wheel connections, self-adjusting anti-roll bars, air shocks, and computer-controlled dampers— all help make for a relaxed, comfortable drive. However, unlike its siblings, this car doesn’t float on the road. You can feel the road ever so slightly, which adds to the sporty driving feel. Even with the road feel, there is no vibration and the drive is never harsh. And while Rolls-Royce now has German parents, it doesn’t feel or drive like a “German” car. It still retains the old British feel, which is refreshing. The Rolls-Royce Wraith is an amazing thing to drive, and totally unique in almost every way. Naturally, the interior is well appointed, as one would expect from Rolls-Royce. TV shows have been produced about the exceptional, old world craftsmanship that goes into building a Rolls. 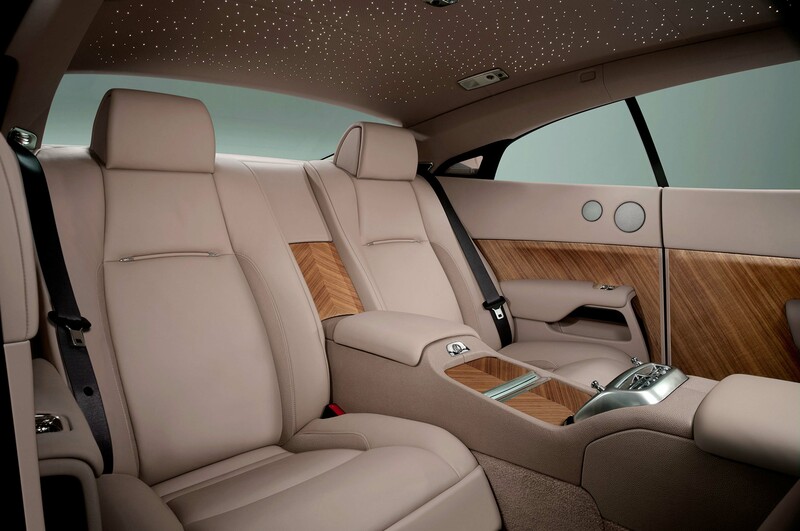 Fine grain leathers, impeccable matchbook veneers adorn the inside of this incredible car. Designers and engineers have also managed to hide much of today’s hi-tech wizardry beneath the car’s unobtrusive glassware knobs, fine leathers, rare woods and glossy lacquers. Windows are double pained, which means you never have to raise your voice to communicate. The cab is as silent as a stately library. Still, even with all the performance and handling features, Rolls-Royce doesn’t want this car referred to as a “sports car.” During the test drive the company’s representative commented that, “Rolls-Royce will never make a sports car, period.” Perhaps so, but Rolls is introducing an SUV to its range next year, so who knows? The rep went on to add that the kind of person who purchases the Wraith wants performance and a racy feel but also appreciates the cocoon of luxury and performance that the car offers. He pointed out that after a while even the very rich can get fed up with scraping and crawling in and out of their low-slung supercars. Can you justify the cost of a roughly S$1.3 million automobile? In Singapore that’s the price of a small two-bedroom apartment. When you consider it, perhaps not unless, of course, you have that kind of money. 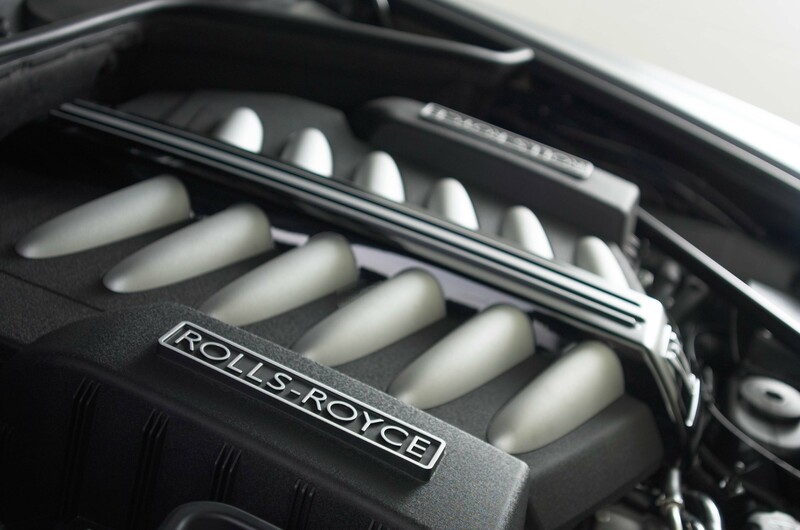 One thing Rolls-Royce loves to tell its customers that their cars are ‘bespoke’. 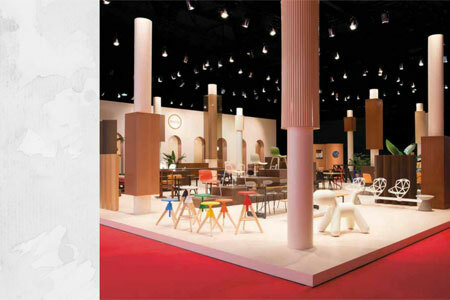 The range of paints, leathers, wood and flourishes are to say the least, limitless. Rolls-Royce will do just about anything to satisfy a client’s wishes. However, that means that there is a wait. The Wraith, and all other Rollers are still built almost entirely by hand. And if you want them to match the color of the car to say, your favorite bathrobe it may take up to two years. In fact, the Rolls-Royce people estimate that adding all the custom touches to a Wraith will add about 30 percent to the cost of the car. In conclusion, the Roll Royce is a pleasure to drive. And if you have the money, it is the pinnacle of what a sporty luxury motorcar should be. And in a world that seems to be changing minute-by-minute, it’s reassuring to know that Rolls-Royce still produces cars with the skill, luxury and charm of a bygone era.